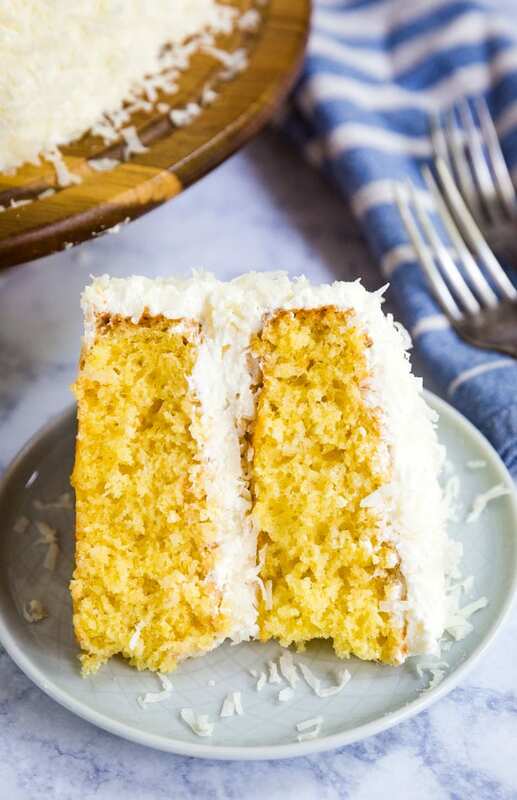 This perfectly moist Coconut Cake will be your new favorite cake for entertaining! No one will ever know it’s made by hacking a boxed cake mix! I absolutely love coconut! Some of my favorite recipe use the stuff, like Coconut Cupcakes with Raspberry Filling and Coconut Key Lime Pie. If you follow my blog then you probably already know that I live for a good cake mix hack. No don’t get me wrong, I love baking a cake from scratch as well. But a good cake mix hack can save time and yield fantastic results. Trust me, when I bring one of these to a party, everyone begs for the recipe. So I figured why not add a coconut cake recipe into the mix? Now, I know coconut can be polarizing, but I love the texture that coconut flakes can bring to a dessert. And the flavor brings me right back to my honeymoon in Hawaii! But I love that is one, in particular, is an easy coconut cake recipe. You take a white cake mix, you doctor it up with some other goodies and you’ve got yourself a cake with the most deliciously moist crumb. 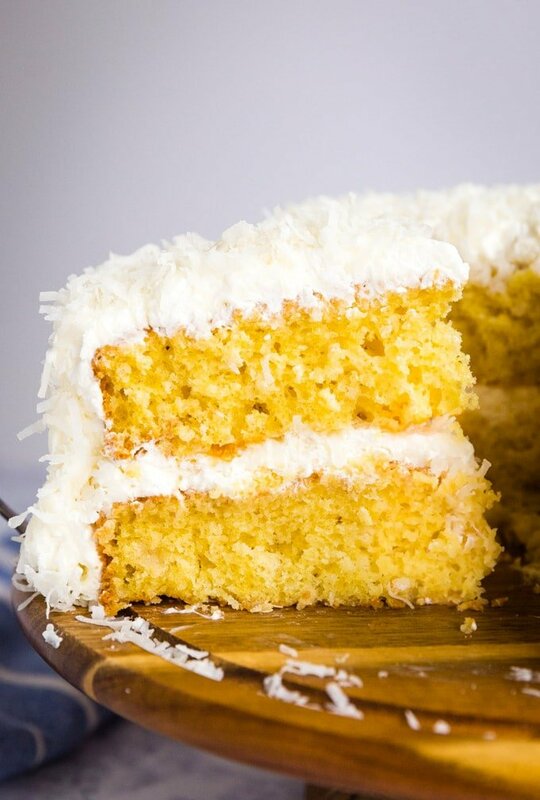 Coconut milk and coconut extract give this cake plenty of awesome flavors. 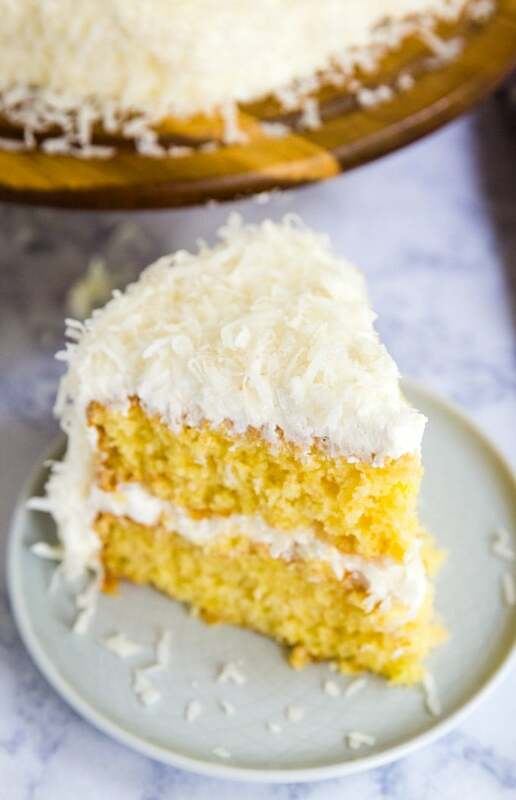 I opted to frost it with fresh whipped cream instead of buttercream because I really wanted this to be as light and fluffy as possible and because I wanted the coconut to take center stage. Be sure to shake the coconut milk really well before opening the can and adding it to the bowl. I’ve had a few people ask about the number of eggs. I know it seems excessive, but that large amount of eggs really makes the most perfectly moist crumb. Trust me on this! Be sure to line your cake pans. I like to lightly trace the outside of the pan on parchment and use that to cut the parchment paper to the correct size. Them I spray the pan with cooking spray, place the parchment into the pan (the spray helps to almost “adhere” it to the bottom of the pan so it doesn’t shift when you add the batter) and spray a little ore cooking spray to the sides and bottom of the pan. Mix together the cake mix, pudding mixes, eggs, coconut milk, oil, and coconut extract until well combined. Bake them both. You’ll know it’s done because it doesn’t jiggle in the middle and when you gently press into the middle it bounces back. Cool them completely (I often bake the cakes the day before). Whip up the cream, coconut extract, and confectioner’s sugar. Place the first layer on your serving dish. I like to take some foil pieces and gently place them under the first layer of cake with the edges sticking out so that I don’t make a mess when frosting and adding coconut to the cake. Spread a generous layer on top of that first cake layer. Sprinkle some coconut on top of it. Place the second layer on top of that and cover the rest of the cake with the remaining whipped cream. Don’t worry if it’s not super pretty! Cover the entire cake with the remaining coconut and refrigerate until serving. 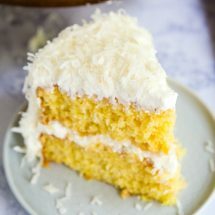 DOES COCONUT CAKE NEED TO BE REFRIGERATED? Because of the whipped cream component in the frosting, I definitely recommend refrigerating this cake within two hours of serving. It will easily last 3-4 days in the fridge. Yes! You can absolutely freeze this cake. I recommend wrapping individual slices in foil or plastic wrap, then in an airtight container. Freeze the cake slices for up to 4 months. 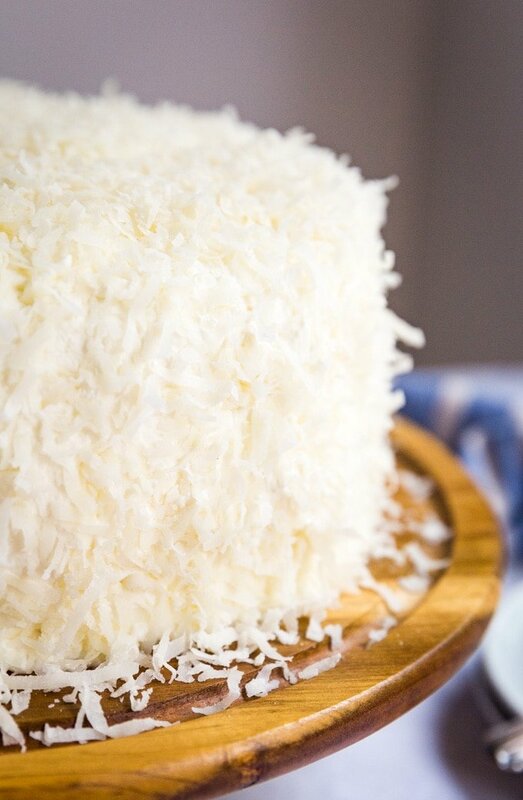 This perfectly moist Coconut Cake will be your new favorite cake for entertaining! No one will ever know it's made by hacking a boxed cake mix! 1 cup unsweetened coconut milk be sure to shake the can well first! Preheat the oven to 325 degrees. Line the bottom of 2 nine inch round cake pans with parchment paper and spray with cooking spray. Set aside. In a large bowl, mix cake mix, instant pudding, coconut milk, oil, eggs and 1 teaspoon coconut extract until well combined. Divide evenly between both cake pans and smooth the top with a spatula. Bake for around 30 minutes, until the cake no longer jiggles and the middle bounces back when very lightly pressed. Cool completely. In a large bowl whip heavy cream, 1 teaspoon coconut extract, and confectioner's sugar until you have stiff peaks. Place a small dollop of whipped cream in the middle of your serving plate to adhere the first layer. Place the first cake layer on top of it and gently press it into place. I like to place pieces of foil under the edges of the bottom layer to protect the cake plate while icing for less mess. Add a layer of whipped cream to cover the top of the first layer (this will be your filling). Sprinkle with 1/2 cup flaked coconut. Place the second cake layer on top of this and very gently press it into place. Cover the rest of the cake with the remaining whipped cream. You want it to be fully covered in an even layer, but don't worry if it's not perfect. I start at the top and work my way down. Carefully cover the outside and top of the cake with remaining flaked coconut. Remove the foil from the outsides of the cake plate. I made this for my 18 yr olds bday it was a huge hit! So much so that his girlfriend requested it for her bday too. Nice! So happy that you and your family loved this recipe! I love coconut anything! This cake looks amazing!